Hi Everyone! Happy Sunday! I hope you are all having a great day! Today I have a Cookie Box to share. I came up with this after seeing a plain box, rather ugly at a store and I really liked the size of it. 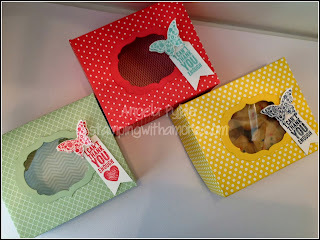 Not too big or too small but just right for a cookie gift box for friends, teachers or relatives . So I tore it apart and made this pretty version. I hope you like it! After this first one, I liked it so much I made more! And so decided to do a video also to share. The video will follow the Supplies List. I know I will be making plenty of these over the holidays for my neighbors and friends with lots of homemade cookies. Yummy! So, I hope you enjoy making these boxes a much as I have. HAVE A BLESSED DAY EVERYONE!!!! If you need any supplies, Go to my SHOP at the top left of this post! THANK YOU , I APPRECIATE YOU ALL!!! Hi Everyone! Since I love to make Bags, Boxes and Treat Holders, I'm going to share another Treat Pouch with you! This time I'm going to use the Label Love Stamp Set. I'm planning on doing a tutorial on this Treat Pouch at a later date. So check back if you are interested in learning how to make this. Sorry about the glare, but I took this picture at night and had an overhead light on. I really like to show the treats when they are as pretty as these sixlets are. Don't Forget your Favorite Treat!!! THANK YOU FOR STOPPING BY TODAY!!!! Don't forget to stop by my SHOP if you need any Stampin'Up products! Hi Everyone! 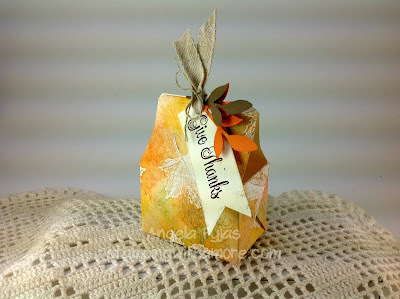 In honor of the first day of Fall and how I love the Fall so much, I created a Give Thanks Card to share. I live in Texas now and I love it, but I grew up in New York where this time of year was so beautiful! Here is a picture of some of the beautiful colors there! This is Faun Lake! Isn't it amazing! I actually got this picture from one of my cousins who has a cottage there! I really miss this! So my card today is inspired by this picture! I remember as a kid collecting the leaves and pressing them in wax paper! Oh memories! Don't forget to go to my SHOP to purchase any supplies you need! THANK YOU ALL FOR LETTING ME SHARE WHAT I LOVE WITH YOU! I Truly appreciate you all! Hi Everyone! Happy Wednesday! Today I'm Sharing a Christmas Card using the Festive Flurry Stamp Set. This stamp set is Beautiful! You can purchase the framelits that go with this set and it makes a gorgeous ornament. I will post that sometime later! 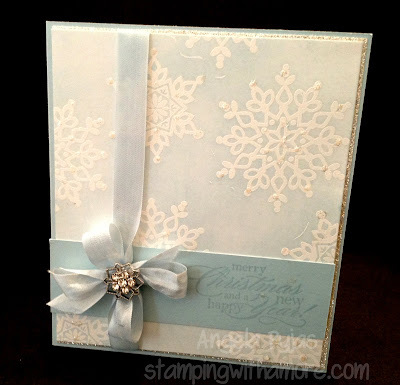 I made this card embossing the snowflakes and using ink over the embossing. If you watched my last video, I used the same technique with the fall leaves. If you would like to see this technique leave me a comment and I will do a video for you. THANK YOU ALL FOR VISITING! If you need any supplies, PLEASE remember you can go to my SHOP at the top of this page. THANKS YOU SO MUCH!! HAVE A GREAT DAY!!!! Happy Sunday Everyone! I love the Fall, so I decided to do something in the spirit of Thanksgiving! And for sure, I have a lot to be thankful for! God is Good! 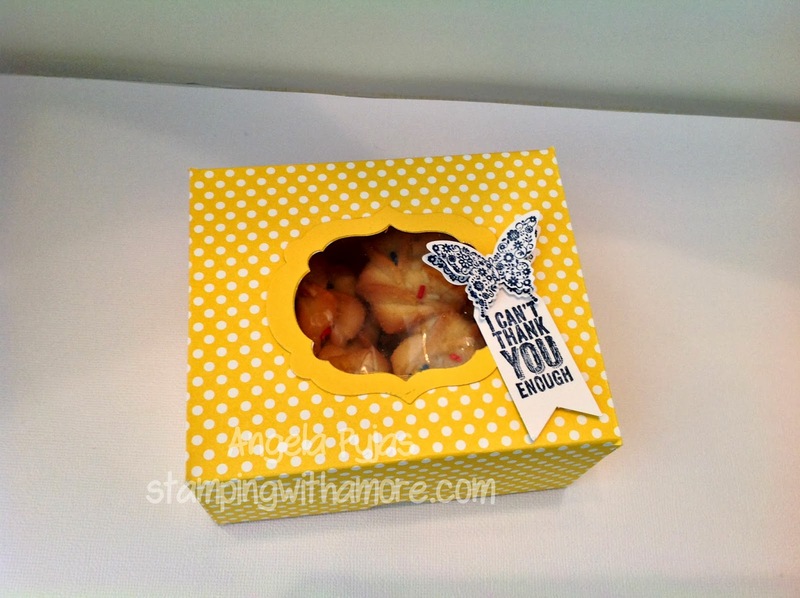 Here is a Treat Box I made to share with all of you! I hope you enjoy! The video will follow. The Box on the right, I heat embossed the leaves on Very Vanilla Cardstock and sponged over the embossed area with different ink. I love this technique. If you would like me to do a video on this technique, leave me a comment and I can do it in a future video. If you would like to order any supplies for this project, Please stop by my SHOP at the top of this page. THANK YOU SO MUCH FOR STOPPING BY! HAVE A BLESSED SUNDAY!! Stampin'Up has added new Clearance items! Check them out by clicking the link below! Hi Everyone! I hope you are all having a great week! Guess what day it is? Hump Day!!! I don't know if anyone has seen that commercial with the camel in the office, but I think its hilarious! Anyway, Today I'm sharing a Birthday card I made using the Five-Way Flower Stamp. This stamp makes the most adorable flower and its all in one Stamp. You do need several scallop punches, but its very versatile. Once you have all the scallop punches, there's so many other projects you can use them for! So its a win-win situation! Isn't this flower so cute! I love the strawberry slush paper, ink and ribbon! This is such a cheery card. It also would make a cheerful get well card. So if you need any supplies, Please visit my Store or hit my SHOP NOW button. THANK YOU EVERYONE FOR STOPPING BY!! I really love sharing my projects with you! FOR ALL WHO LOST FRIENDS AND FAMILY IN 9-11. MY THOUGHTS AND PRAYERS ARE WITH ALL OF YOU! GOD BLESS! Hi Everyone! Ok, Today I have a new Treat Box I made using the Chalk Talk Stamp set from Stampin'Up. I love this little tag that comes in this stamp set. Can you believe I was laying in bed on night and this box came to me. I do that a lot! My mind is always thinking of different ways to use my stamps! I know! Its a addiction! I know some of you can relate! LOL!!! So here it is! I made two different sizes, a smaller version and a wider version. I will post dimensions here for the smaller version and I will be posting the video I made for the larger version and you get the dimensions there. Follow all the instructions of the larger version except for the box part you will use a matching piece of cardstock measuring 1.5" x 8" . Then score on both long sides at 1/4". On the short side score at 3" and 5" same as the larger version. Please REMEMBER if you need any supplies for this project you can visit my online SHOP . THANK YOU FOR STOPPING BY !! I appreciate you all!! Now here is the video for you! Hi Everyone! I'm once again going to post a Holiday Card. This time a Christmas Card featuring the Festive Flurry Stamp Set. I actually used four different stamp sets for this card. I really like the way it turned out. I hope my picture does it justice! I'm still working on taking better pictures. I simply love the holidays, so I hope your enjoying the holiday things I'm posting as much as I love sharing them! Scentsational Season (disc) I used this for the stars, so you can use any star stamp. THANKS SO MUCH FOR VISITING!!! Remember to visit my SHOP if you need to order any of these supplies! Hi Everyone! Happy Sunday! I have two things to share with you today. 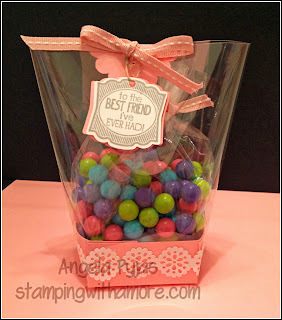 I'm showing you a quick and easy treat bag to make. I used a ready made bag I purchased at my local craft store. Dressed it all up for Halloween! Second, I'm sharing a video I made to show how to make envelopes using the new Stampin'Up Envelope Punch Board. Your going to love this! 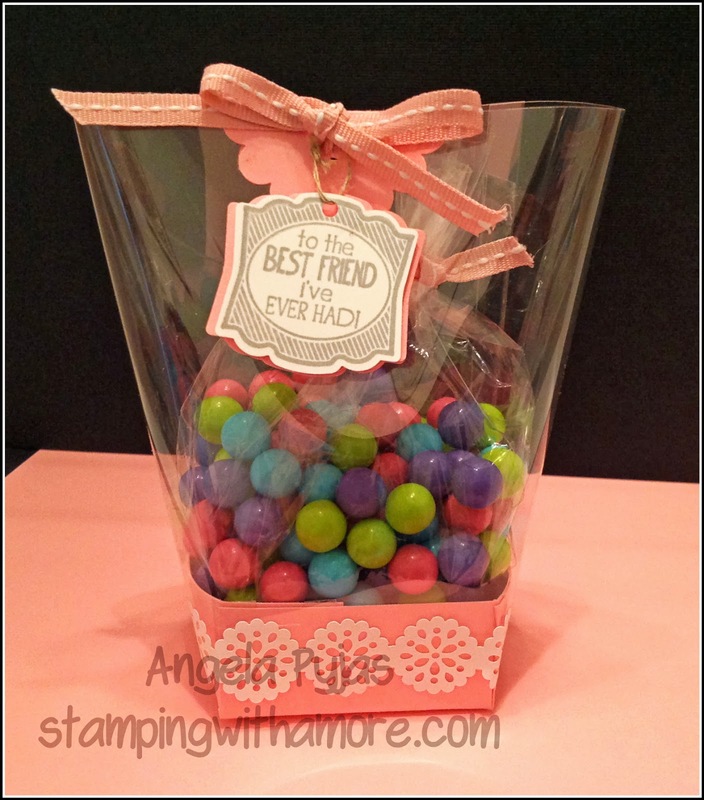 Isn't this a cute little treat bag! 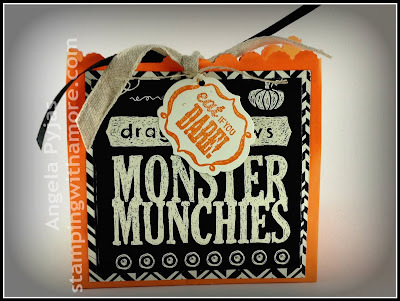 I used the Stampin'Up Halloween DSP. Witches Brew! I've used this paper with several of my Halloween projects. Love IT! 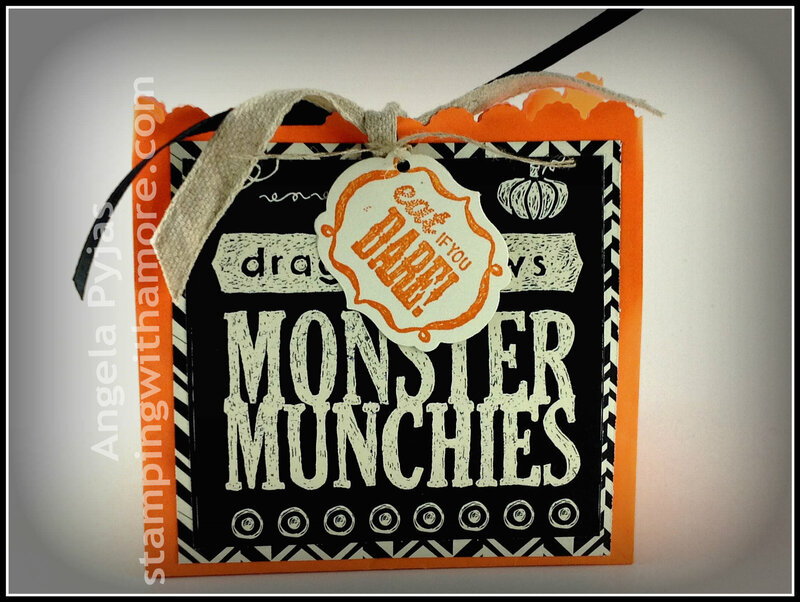 The Witches Brew Paper comes with sheets already printed with little sayings like this Monster Munchies, so all you have to do is cut them out and glue them on! How easy is that! I cut a hole in the top and added ribbon and the little tag. I also cut the top of the bag with a Stampin'Up Adorning Accents Edgelits 1255595. 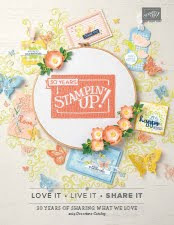 REMEMBER TO ORDER ANY STAMPIN'UP SUPPLIES YOU CAN GO TO MY STORE OR CLICK THE SHOP NOW BUTTON! 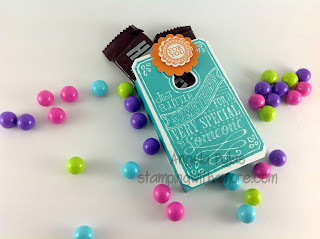 Now Here is the Video of the new Stampin'Up Envelope Punch Board. 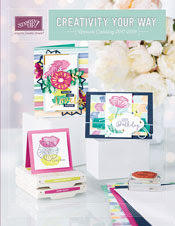 For those of you who love making cards, You will have to have one of these! I don't know how I lived without this so long! I was always stuffing cards in envelopes that never fit! NEVER again! LOOOOVE THIS! I'm a Wife,Mother and Grandmother who loves her family. God is above all things! I love everything Paper Crafts. 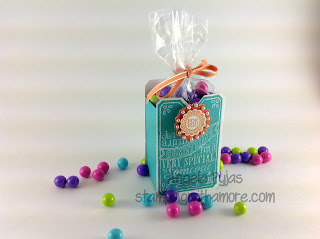 My number one passion is Stamping.I absolutely Love making Boxes and Treat Bags! I also love to bake all kinds of goodies! You will, I'm sure see how I blend the two together! I hope you will join me!